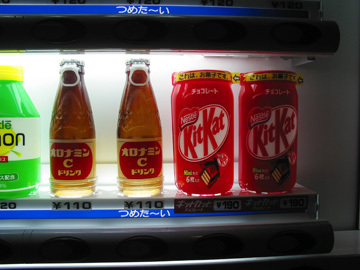 KitKat candy in a can and Oronamin C, an energy drink, are housed in the cold section of a vending machine. I spotted this in Narita Terminal. After graduation from the University of Hawaii, where I studied mostly drawing and painting, I landed a job teaching English in Hiroshima, Japan. Living anywhere for two years is long enough for the unusual to become the norm. I never gave much thought to photographing my environment, even though it was so different from Honolulu. Of course, my parents' admonitions not to waste film always echoed in my head. That is, until recently, when I began working with a bunch of Star-Bulletin photographers. Last month, I visited Japan again with some friends. And this time, I went armed with a Canon Powershot G2 digital camera. Spoiling film wasn't possible any longer. Millions of pictures have been taking of the Land of the Rising Sun. It's a photogenic place, after all. However, instead of documentary images, I wanted to explore ordinary scenes through light and texture. Big-city Japan's nighttime lights are numerous and robust. The nation's northerly latitude and mild winter daylight are a huge change for eyes used to our islands' vigorous sunlight. Subject matter was a concern, but I felt both texture and light often became more interesting than content. 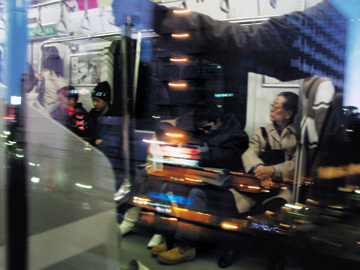 A young couple snuggles on a local Tokyo train, while nighttime lights stream by through the opposite window. How times have changed; Japanese people aren't known for public displays of affection. 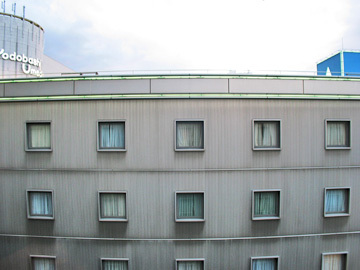 A view of another wing of my hotel. I found the texture of the building and the evenly spaced, closed windows strangely hypnotic. In the background is the sign for Yodobashi, a giant electronics store. Tokyoites seem used to humongous creatures roaming their city, above. 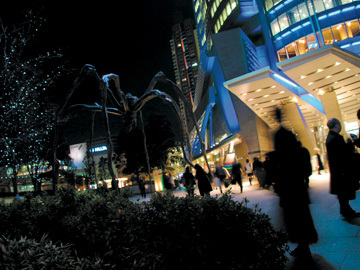 This giant spider looks ready to crawl up the side of the Mori Tower in Roppongi. The statue, by French artist Louise Bourgeois, is titled "Maman" (mother). Eggs are visible in its belly from underneath it. 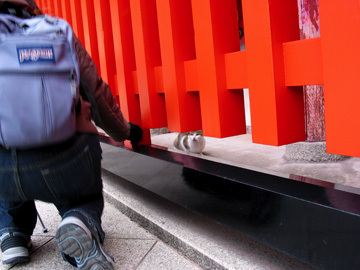 » The Fushimi Inari Taisha shrine is in Kyoto, Japan. A photo caption on Page D5 on Monday incorrectly said it was in Osaka.